This recipe is inspired by Billie-Jo Lucy Lemire from her post in a Facebook group. It’s beyond easy and super delicious. She served hers with a side of asparagus (which I LOVE) but I did mine with a side of something else. I used an entire package of bacon (because that’s what I had in the freezer) and 3 boneless skinless chicken breasts. 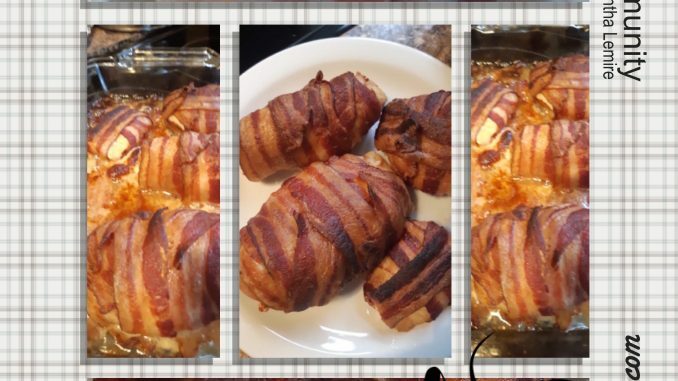 To speed things up, I boiled the chicken until it was almost cooked throughout, then (after they cooled a bit), I wrapped the bacon around them – lined the casserole dish with the remainder of the bacon, placed the bacon-wrapped chicken on top, and baked for about 40 minutes at 375ºF (until the bacon looked crispy).